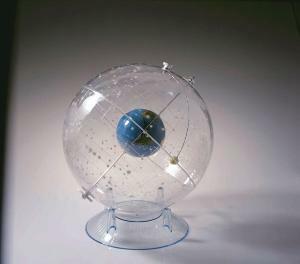 Set the outer star globe, internal 4" Earth globe, and internal sun to view star positions at any time or place. The transparent plastic globe features constellations, stars to the fifth magnitude, major nebulae, bright stars and clusters, and the Milky Way printed on the inside of the transparent plastic globe, leaving the outside free for drawing planets or other objects. The globe rests in a durable cradle base and comes with a study guide. Size: 12" dia.